Mounting and Post Height needed solution to be chosen above. The Novus TSS Post stands above the work surface and can be used to mount slat rails, monitor arms, and slat walls. The Novus TSS Mounting Post stands above the work surface and can be used to mount slat rails, monitor arms, and slatWalls. It also includes two cable clips for cable routing. Three Post Heights available. Table Clamp 1 - for surface thickness of .55" to 1.5"
Table Clamp 2 - for surface thickness between .2" to 2.75"
Note: For alternative mounting options see below and make your choice above. 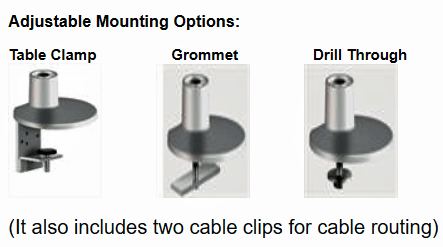 All mounting options are included at no charge.